Workers at two rail companies are set to strike over the Christmas period in a dispute over "guards and safety". Members of the RMT union employed by Greater Anglia are poised to walk out for 24 hours on 27 December, while those employed by South Western Railway will do the same on 31 December. It comes after a meeting with Transport Secretary Chris Grayling and the rail minister Paul Maynard on Tuesday. Rail Minister Paul Maynard accused the RMT of wanting to "play Scrooge". South Western Railway said it would put "contingency plans" in place should the strikes go ahead. Greater Anglia said it hoped to run a "revised Christmas service" that had already been put in place and said it would be going ahead with previously planned talks with the RMT on Thursday. The union said it had received "contradictory messages, confusion and lack of clarity" from the meeting. The RMT said it was told in the meeting the government was "not opposed to a second person on a train". But Mick Cash, RMT general secretary, said: "Within an hour of that meeting I received letter from Chris Grayling asking the union to accept the principle of driver-only operation." Richard Dean, train service delivery director at Greater Anglia, said: "We value our conductors highly. We have guaranteed their jobs until the end of the franchise in October 2025. "In fact, we will be recruiting additional conductors, as we are replacing all of our trains with brand new trains from 2019, which will enable us to run more services." 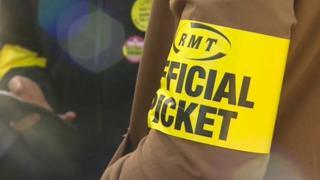 A South Western Railway spokesman said it had "repeatedly assured" the RMT it planned to keep guards on trains. The spokesman added: "We are extremely disappointed that the RMT executive has decided to inflict more disruption on our passengers by calling more unnecessary industrial action, especially when so many people need to travel to be with friends and family for the New Year celebrations." Anthony Smith, chief executive of the independent watchdog Transport Focus, urged all parties to resolve the matter "without bringing the railway to a standstill". "Yet more strikes are being dumped on passengers who may have to cancel plans or endure disrupted journeys over Christmas," he said. Rail minister Paul Maynard said: "The RMT now wants to play Scrooge by causing strife and misery to rail passengers over the Christmas period - however rail companies will keep passengers moving and the majority of services will run as planned. "This dispute is not about jobs or safety. Employees have been guaranteed jobs and salaries, and driver controlled trains have been used in the UK for more than 30 years, with the independent rail regulator confirming they are safe."